Williams arrived in London facing a wrongful death suit after she was involved in a fatal car crash in Florida. 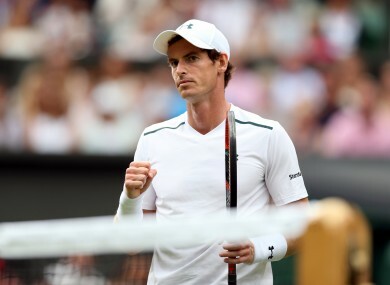 DEFENDING CHAMPION Andy Murray celebrated the news that he’s about to become a father again by reaching the Wimbledon second round Monday as fellow two-time winner Rafael Nadal aimed to clinch the 850th win of his career. “I have felt OK the last few days and the adrenaline you feel by playing a match numbs any pain you may have,” said the British star after seeing off world number 134 Bublik who was making his grass court debut. German world number 97 Brown came back from a set and a break down to beat Portugal’s Joao Sousa 3-6, 7-6 (7/5), 6-4, 6-4. Nick Kyrgios, who shocked Nadal at Wimbledon in 2014, won’t get another opportunity. The combustible 20th seeded Australian was 6-3, 6-4 down to France’s Pierre-Hugues Herbert when he called it quits on Court Three after failing to shake off the hip injury which has plagued him in recent weeks. “I kind of knew I was in trouble. I have been feeling my hip ever since I fell over at Queen’s Club,” Kyrgios said. “Never got it right. I was doing everything I could to help it, but just not enough time. Yeah, I mean, I just wasn’t 100 percent. Kei Nishikori, the Japanese ninth seed, beat Italy’s Marco Cecchinato 6-2, 6-2, 6-0 in just 72 minutes. Sam Querrey of the United States, who stunned Novak Djokovic in the third round last year and precipitated the Serb’s slide from the top, also made the second round. The 24th seed saw off Italy’s Thomas Fabbiano 7-6 (7/5), 7-5, 6-2. Women’s second seed Simona Halep, blasted off court in the French Open final by Jelena Ostapenko, downed New Zealand qualifier Marina Erakovic 6-4, 6-1. Halep, a Wimbledon semi-finalist in 2014, next faces Brazil’s Beatriz Haddad Maria. Venus Williams marked her 20th Wimbledon anniversary with a 7-6 (9/7), 6-4 win against Belgium’s Elise Mertens. Williams will face China’s Wang Qiang for a place in the last 32. Later Monday, Nadal, the champion in 2008 and 2010 and a three-time runner-up, faces Australia’s John Millman, the world number 137. The Spaniard missed last year’s championships because of a wrist injury but is back at the All England Club buoyed by his 10th French Open title. Nadal is bidding to record his 850th tour-level match-win and become just the seventh player in history to reach the landmark. It’s also his 50th match at Wimbledon. Millman is playing just his second match of the year after missing five months with a hip injury. Former world number one Victoria Azarenka plays her first Slam since becoming a mother, while two-time champion Petra Kvitova is sure to receive a warm Centre Court welcome as she steadily rebuilds her career after being attacked by a knifeman in her home last December. Kvitova, whose career was almost ended by the injuries caused fighting off an intruder at her home in the Czech Republic, takes on Sweden’s Johann Larsson, the world 53. In the absence of Serena Williams (pregnant) and Maria Sharapova (injured), Kvitova, boosted by winning the recent Birmingham grass court title, finds herself in the position of favourite for a third title to add to her 2011 and 2014 triumphs. Kim Clijsters, Margaret Court and Evonne Goolagong are the only women to have won a Grand Slam after having a child. Men’s fifth seed Stan Wawrinka, looking to complete the career Slam, faces Russia’s Daniil Medvedev. French Open winner Jelena Ostapenko, the 2014 Wimbledon junior champion, takes on Aliaksandra Sasnovich of Belarus. Email “Murray eases through, Kyrgios quits and Venus gets up and running ”. Feedback on “Murray eases through, Kyrgios quits and Venus gets up and running ”.